Fiction – paperback; Vintage; 191 pages; 2004. 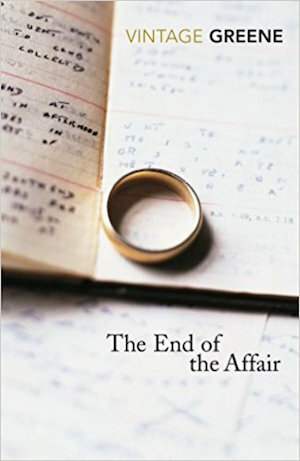 Is there anyone out there who doesn’t know the basic premise of The End of the Affair , which was first published in 1951 and has remained in print ever since? It must be the late Graham Greene‘s most famous novel. It’s been adapted for the screen twice — in 1955, starring Deborah Kerr and Van Johnson, and in 1999 starring Julianne Moore and Ralph Fiennes — and transformed into an opera in 2004 by the American composer and pianist Jake Heggie. It’s a dark but ultimately compelling tale about one man’s tortured relationship with a woman he cannot have and the decisions people make that impact on the rest of their lives. The basic storyline revolves around a doomed love affair that takes place in 1940s war torn London. Maurice Bendrix, a successful writer, falls for Sarah Miles, the wife of a dreary civil servant with whom he has struck up a business relationship. For five years Bendrix (he is rarely called by his first name throughout the book) and Sarah conduct an illicit, passionate affair until Sarah calls it off without warning or explanation. This is an incredibly moving story that brims with pathos and anger throughout. Initially told from Bendrix’s rather damaged point of view, we later learn Sarah’s side of the story via her journal which has fallen into Bendrix’s hands. Her diary entries provide a glimpse into her view of the affair and her deep and abiding need to escape the routine dullness of married life any way she can. It also reveals a surprising element to Sarah’s character, namely her relationship with God, and the reasons why she gave up Bendrix all those years ago. I found the book quite a devastating, heart-rending read that reveals a London I barely recognise. The narrative is incredibly dark and bleak and depressing, but there are chinks of light as well, and more than two weeks after reading it the story still lingers in my mind and no doubt will stay with me for the rest of my life. In short, a compelling read and one that has inspired me to dig out more of Graham Greene’s rather prolific back catalogue. And as much as I would love to see the Julianne Moore/Ralph Fiennes version of the film, I’m too scared to watch it lest it fails to live up to the brilliance of this short but incredibly wise and knowing novel. Oh-what a good review! I’m afraid to watch the movie as well. No, the Moore/ Fiennes film isn’t as good as the book… but it is still worth watching. I agree with Philip, the film is pretty good. Lovely review! I read this one a year or so ago and really enjoyed it for its emotional impact. I thought the movie was well worth watching also. Nothing is ever as good as the book, but I love Fiennes’ acting in general. He plays the tortured male so well!